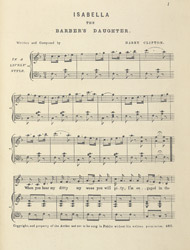 A distinctive type of song became popular in the Music Halls of the 19th Century. Songs typically had a limited musical range consisting of a verse or chorus with simple lyrics, which the audience could pick up quickly, and the performer would adopt a caricatured persona. The lyrics of this song include 'Her eyes were as black as the pips of the pear', which sounds a little strange to us but would have been a common term of endearment. Harry Clifton takes his audience on a tour of attractions around London such as Madame Tussaud's and Kew Gardens.